I know exactly what you’re talking about! We loved Sagrada Familia. I will never forget it. One of the most beautiful buildings I’ve ever been into. It really feels sacred. 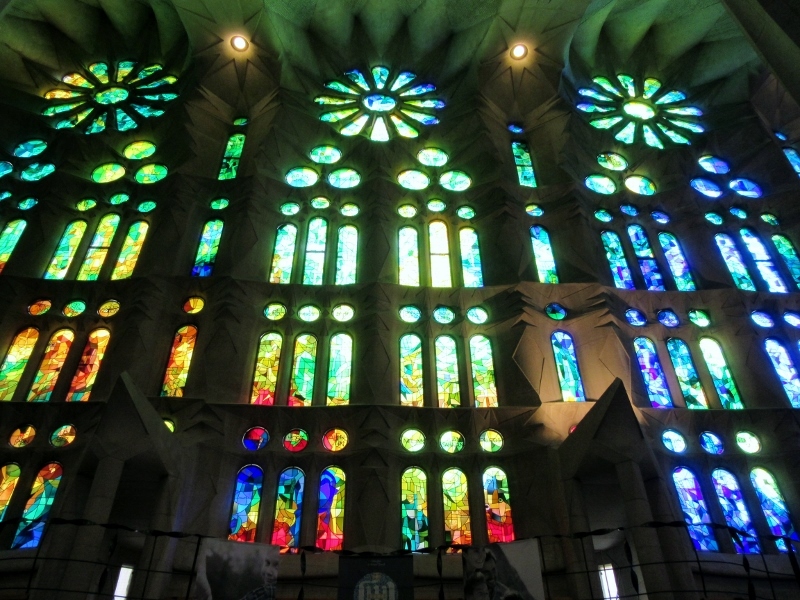 We’re hoping to visit again in the next few years to see the progress made in the construction of the church as well as to re-experience Gaudi’s vision. It’s a place that “touches” many people and a visit seems to be a universal experience that stays with you for years! It makes you wonder if Ken Follett had visited this awesome church before he wrote the novel, doesn’t it? I love the idea of how fact and fiction can become intertwined to educate us as well as entertain! I first visited La Sagrada Familia as a college student back in 1983, and again later, sometime in early 2000’s. In 1983 it was a lot less crowded, but also a lot less of the sculpture was there, or perhaps it just wasn’t visible under scaffoldings, etc. Even then, though, it was awe-inspiring, and seems to grow more so as the building progresses! I imagine it’s fascinating to think back to what it was like when you first saw it and track it’s progress over the years. The crowds are huge now and, because this place is the number one tourist attraction, will only increase. 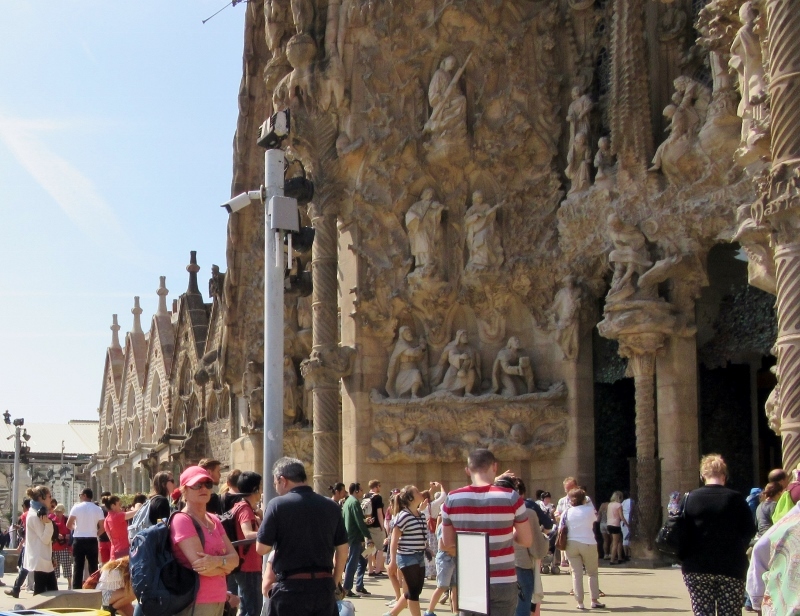 However, a place like La Sagrada Familia deserves to be seen and appreciated by everyone! It’s such an amazing place, isn’t it? We drove by and had a good look from the outside when we were in Barcelona, but alas, we just didn’t have time to go inside as we were on such a limited schedule. (The joys of travel writing!) Thjx for the great post, Anita. The pleasure was all ours. If you have a chance to visit the city again I’d highly recommend an inside visit and allow a bit of time to take it all in. This place is what travel is all about! 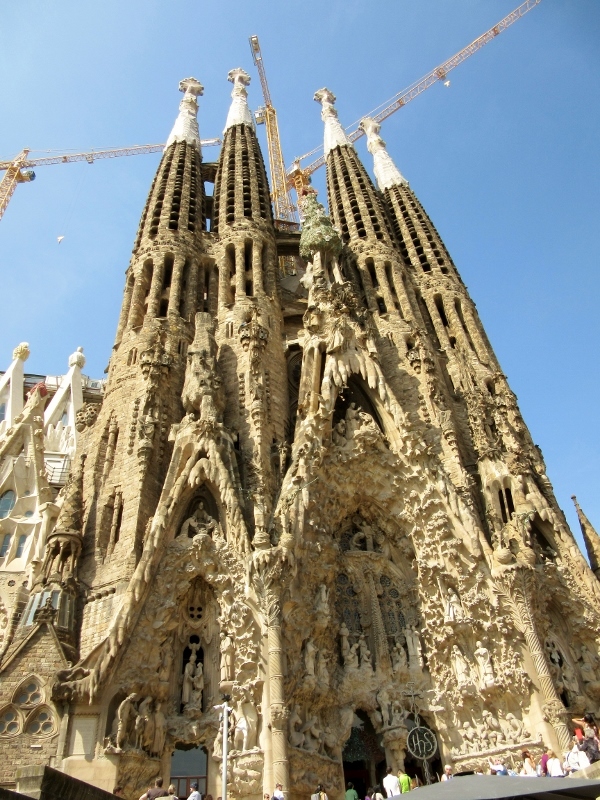 I revisited La Sagrada Familia when I was in Barcelona in April. I was last there in 2005. Notable progress had been made in those 10 years, especially on the inside which I agree is riveting. I would have loved to have heard an organ concert there. I’d recommend that people wanting to visit inside, reserve tickets ahead of time on-line—several weeks ahead of time if they want to be able to go up into one of the towers. We reserved online tickets with the audio headsets a few days ahead but neglected to make sure the climb up the towers was included and missed that! It gives us an excuse to return but I was so disappointed that we couldn’t see everything as well as the city views from the high perspective. Looking forward to next time! Missed you last week! Anyway, we haven’t been to Barcelona. Your account here tells me why precisely La Sagrada Familia is such a city icon. Maybe we should go in 2026? No, that’s too long a wait! 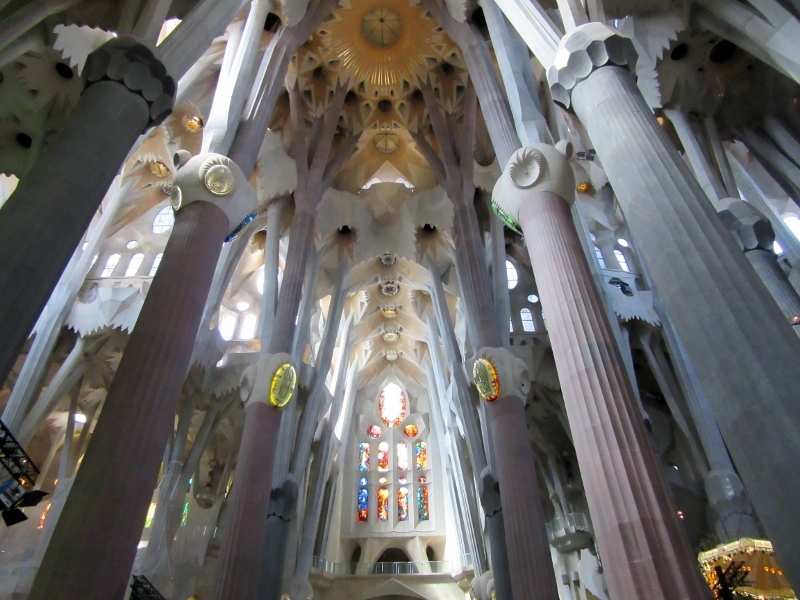 It’s an amazing church and a definite “must see” when you find yourselves in Barcelona. We are already planning a return trip to Spain in a year or two so that we can continue our travels through this fascinating country and re-visit the basilica to check its progress. Next time I think a formal tour might be the way to go! 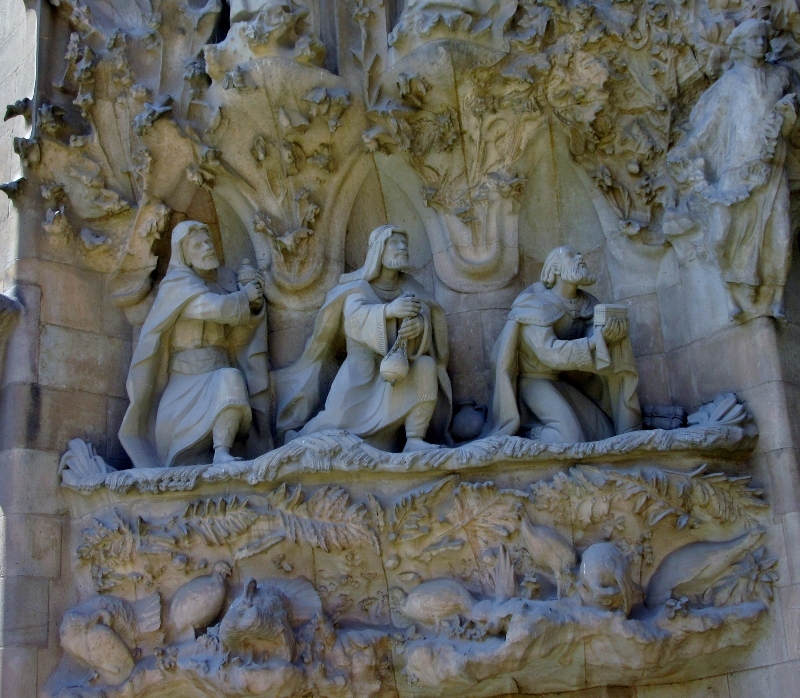 Having also loved the book “The Pillars of the Earth”, I found your comparison with La Sagrada Familia very interesting and appropriate. Thanks for a great posting! I have not been to Barcelona in 8 years, I can imagine how much has changed and how much has not changed. It is such a slow and magnificent process. I also read “Pillars” years ago, what a smart comparison! Thanks Suzanne. For some reason, the book was one of the first comparisons we thought of since both churches represented the dreams and aspirations of the people who built them and were constructed over lifetimes rather than years. Kind of an amazing concept now in the age of immediate gratification, isn’t it? And to think when we renovated the bungalow, we thought two years was unbelievably long. 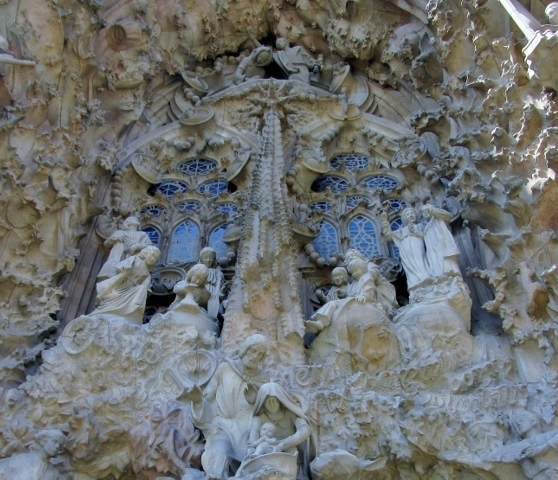 (am I comparing my house to Gaudi’s La Sagrada Familia? ) The interior shots seemed dream-like. What an experience! We’ve also gone through remodeling projects that seemed to never end. That said, I kind of like the idea of a building that is never quite finished and always awaiting the next improvement or artistic flourish! We were really glad to go at our own pace for our first visit so that we could slow down and absorb both the atmosphere and all the details. Next time however, I like your suggestion of a guided tour when we return to see how the construction is progressing. I so hope I get to see La Sagrada Familia with my own eyes some day. Your photos are beautiful. Thanks Nathalie! La Sagrada Familia will still be there whenever you have the opportunity to visit and just that much closer to completion! All I can say is – ‘Wow’! There are a lot of superlatives that can be applied to La Sagrada Familia but “WoW” works very well! We sat inside La Sagrada Familia for hours just taking it in. Still think it is the coolest building ever. That was several years ago and from your pictures it looks like much more is finished now. We must go back! it’s a place that you have to be still to absorb the light and atmosphere and all of the thousands of details. We listened to the audio tour which gave the facts and history but it was distracting. And you’re right, it’s a place to meditate and take one’s time absorbing it. I don’t think we could begin to guess how far from complete the building is but there’s a lot of work left. What’s really amazing is that the unfinished building has already been awarded recognition by the UNESCO WHS. And, like you, we’re thinking about a reread of “Pillars of the Earth” ourselves, especially after seeing this neo-gothic wonder! La Sagrada Familia is a beautiful building. Your photos brought make memories of my visit a couple of summers ago. The architecture is fascinating and the interior feels so peaceful. How lovely to hear an organ recital there. We plan to visit the church again in a few years to see the building progress and you’re right, Gaudi’s design is fascinating. I didn’t quite know what to expect from the photos but it totally exceeded what I’d pictured and, unlike so many icons, lived up to its reputation. It’s a fabulous building. I was interested to see that a completion date is now forecast – when I visited no-one thought the project would ever get to the end! 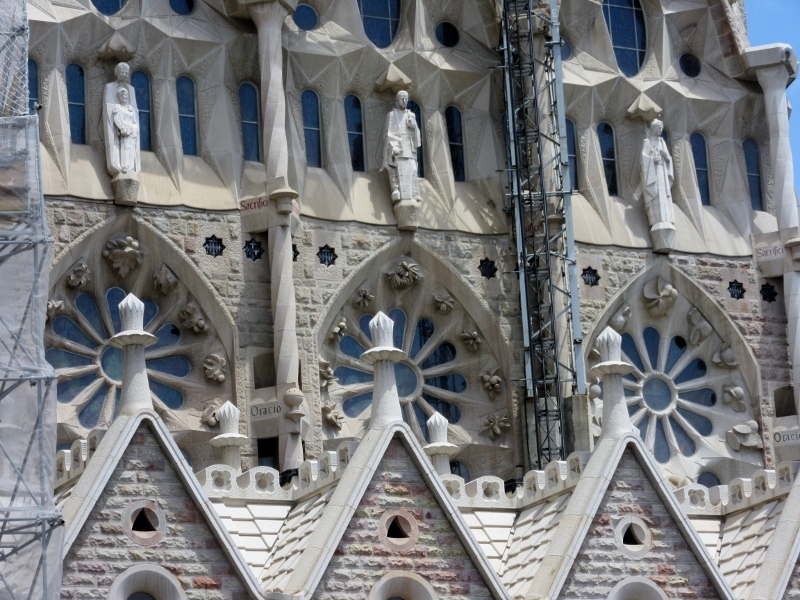 They’re hoping to have the church completed by the 100th anniversary of Gaudi’s death but it looks like there’s so much work left to be done. Luckily the money and donations keep pouring in to fund the building and it must be motivating to so many people to think that the project may really, one day, be finished. 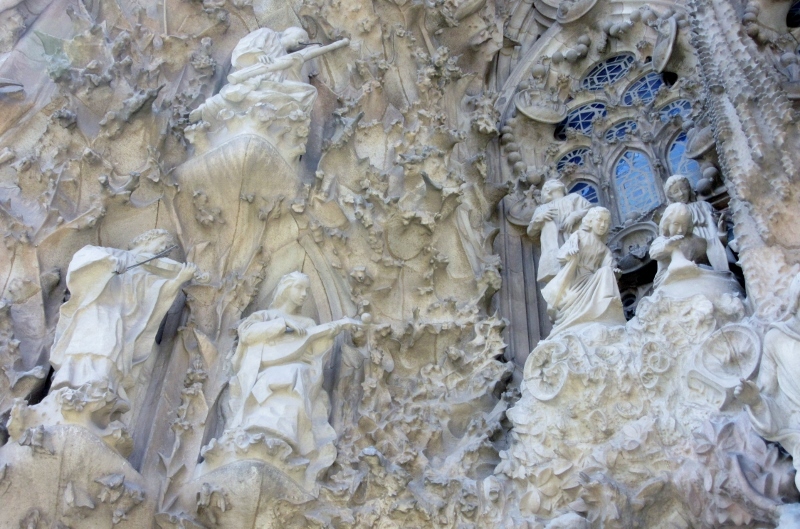 Barcelona is a favorite destination of ours, and we never cease to marvel at La Sagrada Familia. Hearing a musical performance in this space must be something special indeed. What a treat! A lot of travel seems to be about timing and serendipity and hearing the organ playing throughout the church was just a matter of luck. The music definitely added a layer of mystique and gravitas to the atmosphere of the church and made our visit there, like you said, very special. I can’t believe I haven’t been to Barcelona! Your photos of La Sagrada Familia are truly stunning and I love the description of how “tree-like pillars reach from earth to heaven” It’s a shame Gaudi didn’t live to see it completed but I imagine he had a vision of it in his mind that inspired him and offered satisfaction. Thanks, Michelle. When I saw the pillars I immediately thought of the book “Pillars of the Earth” and the conflict that the builder/architect must face when they know that their work won’t be completed in their lifetime. But what a legacy! La Sagrada Familia was ana amazing place to visit, despite the crowds. Hearing Ave Maria would have been so emotional in such a magnificent setting. To see so many people gathered in one place to visit a church was pretty unique in itself and, obviously, La Sagrada Familia’s reputation precedes it. We were prepared to be disappointed because of the hype but it really lives up to its reputation and then some! We were fascinated too by La Sagrada Familia! To hear an organ recital there would have topped off a fabulous visit. Did you go to the roof….the views from there are amazing! We read later that there will be a total of four organs in the basilica which will be magnificent with the structure’s amazing acoustics. I’m not sure if our timing was just perfect or if the organ plays daily around noon but the music lent another layer to our time in the church and totally enhanced our experience. We were too, Ed. Awesome is a perfect one-word summation to describe our visit to this basilica.